IMTTI is affiliated to Bharat Sevak Samaj , National Development Agency sponsored by the Planning Commission, Government of India. Affiliation No. KAR204. IMTTI is affiliated to All India Council of Education, an Indian National Eminence Professional Body for Education. A.I.C.E. is registered with Govt. of India as a non-profit organization of higher learning. The Council provides leadership in education areas of direct importance to the national development and economy. 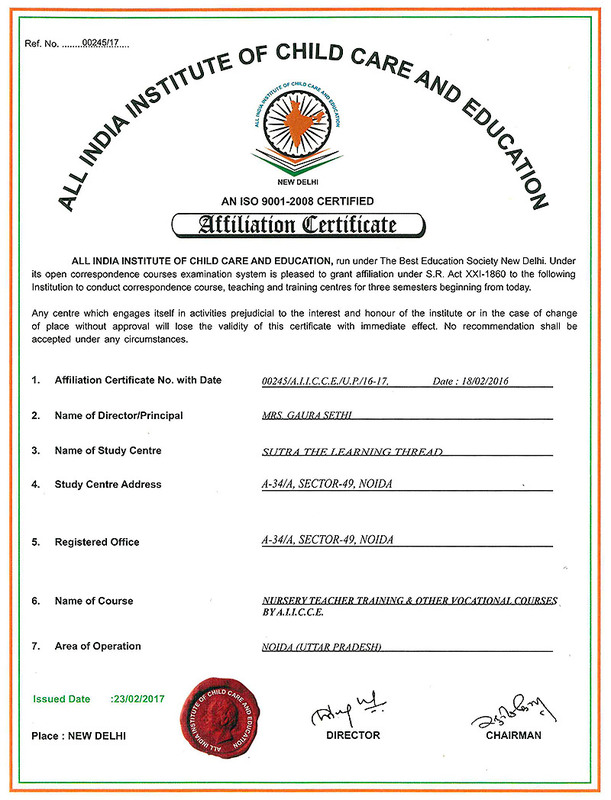 IMTTI is Recognized Member of All India Association for Educational Research or AAIER is an organization dedicated to research the problems associated with it. The accreditation by AAIER is well accepted by the teaching fraternity of Asia. The qualifications of the Indian and other Asian teachers increase manifold with this accreditation. IMTTI is accredited by International Accreditation Organization (IAO) for achievement of highest standards in Organizational Management, Business Management and Business Performance through a commitment to quality and continuous improvement in Education. IAO is associated with world's leading and nationally recognized quality assurance agencies worldwide for betterment of educational standards. Some of the current IAO partners are : Department of Adult & Higher Education, Ministry of Education (Bhutan), The National Commission for University Evaluation and Accreditation (Argentina), The National Higher Education Accreditation (Costa Rica), The Accreditation and Quality Assurance Commission (Palestine), The Agency for Development of Higher Education and Quality Assurance (Bosnia and Herzegovina), Accreditacion Agencia (Chile), The Quality Assurance & Accreditation Council (Sri Lanka), Public Agency for accreditation of Higher Education (Albania), Center for Quality Assurance and Accreditation for HEI (Libya) and Higher Education Quality Evaluation Centre (Latvia), etc. International Education Accreditation Commission recognizes IAO's accreditation standards. An IAO accreditation will enhance the recognition and acceptability to an international level. The Indian Society for Training & Development (ISTD). The Indian Society for Training & Development (ISTD), established in April 1970, is a national level professional & non-profit society has a large membership of individuals and institutions involved in the area of training and development of Human Resource from Government, Public and Private Sector Organizations & Enterprises; Educational and Training Institutions and other Professional Bodies. The Society is affiliated to the International Federation of Training and Development Organizations (IFTDO), Geneva and Asian Regional Training and Development Organizations (ARTDO), Manila. IMTTI is a proud Recognized Institutional Member of ISTD. IMTTI is an institutional member of The Association for Early Childhood Education & Development (AECED), TATA Institute of Social Sciences, Deonar, Mumbai - 400 088, a nationally registered body which has grown out of the Indian Association for Preschool Education formed in 1964 to bring together not only professionals working with children but involving parents and stakeholders as well. AECED promotes child’s right to education through a variety of activities throughout the year which increases the awareness about the holistic development of each child emphasizing “Education for All” through a network of government and national bodies. ISO 9000 specifies the requirements for a Quality Management System overseeing the production of a product or service. It is not a standard for ensuring the quality of a product or service; rather, it attests the process of production and how it will be managed and reviewed. 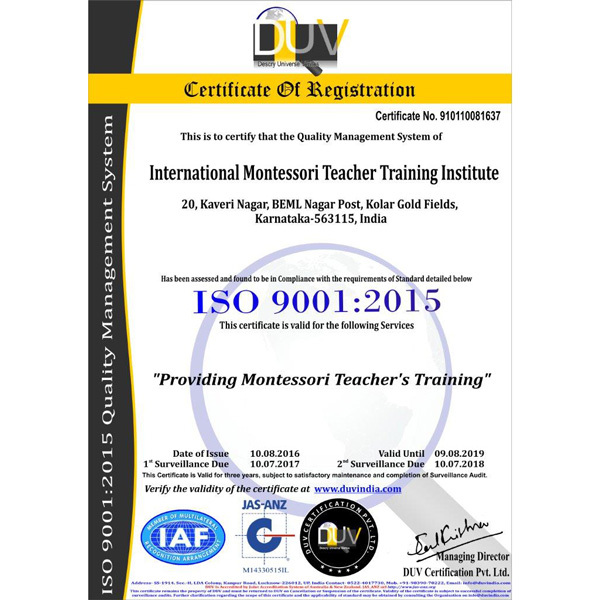 The quality management system of IMTTI was awarded ISO 9001:2015 Certification which conforms to the global BS EN ISO 9001: 2015 quality standard. We, IMTTI, have developed a system of policy statements, operating procedures and work instructions to assure the quality of the services we provide to our external customers (those who are participating in training) as well as to have the quality of the training to be of highest standard. This "quality system" guides us in accomplishing our goals of achieving the highest standard and maintaining students' satisfaction. At IMTTI, we often have a number of different products in house, as well as many units of single products like online & onsite versions of different training. We believe that effective service identification and traceability will result in reduced costs by helping eliminate wasted effort and material due to mix-ups or lost products. It will also ultimately result in increased business due to customer satisfaction from getting expected quality of services.